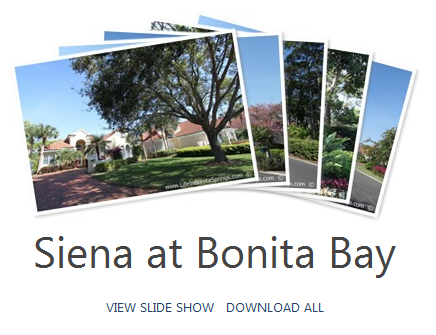 Siena is an intimate community of twenty-five villa homes located in Bonita Bay. Homes in Siena at Bonita Bay were constructed from 1992 to 1996 with square footages ranging just under 2,100 square foot to nearly 3,000 square foot of living space. Every home in Siena at Bonita Bay has a private swimming pool. Siena homes have a variety of views which may include golf course, nature preserve or lake. Home ownership in Siena at Bonita Bay includes lawn services which offers convenience for those who are seasonal residents of Bonita Springs. Siena Bonita Bay is minutes from Coconut Point and only about fifteen minutes to gulf beaches. Home owners in Bonita Bay and in Siena also enjoy the many active lifestyle amenities of Bonita Bay which include beach park, private parks, fitness center, tennis center, golf and country club plus marina. Homes in Siena are not frequently on the resale real estate market. To search for homes similar to Siena in Bonita Bay consider visiting the information pages for Montara at Bonita Bay, Woodlake at Bonita Bay and Sanctuary at Bonita Bay. To learn more about the amenities available to Siena residents, read also: Bonita Bay Golf and Country Club.